[IMAGE 4 of 4] The seeds of western tansy-mustard (Descurainia sp.) 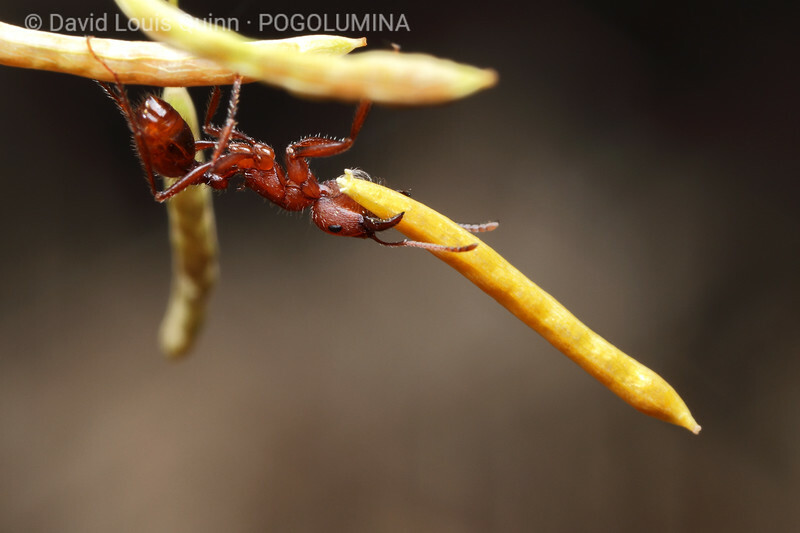 are apparently a very important source of food for the Pogonomyrmex salinus ants of central Washington state. This series of four images was captured in the space of less than one minute - as a determined worker removed a relatively huge seed-pod from a living plant near her nest. Using her legs and gaster (large abdominal body part) to maximize leverage, she can be seen cutting through the stem, just below the seed-pod (1st and 2nd images). Suddenly, the pod is cut free, and the ant climbs out to the end of a seed-pod below, with cargo firmly held in her mandibles (3rd and 4th images). Two seconds after the last image, she dropped to the ground (from a height of about 25 cm / 10 inches) and ran at full speed to the nest, disappearing into the entrance with her prize.